This review originally written for DVDTalk.com in 2011. 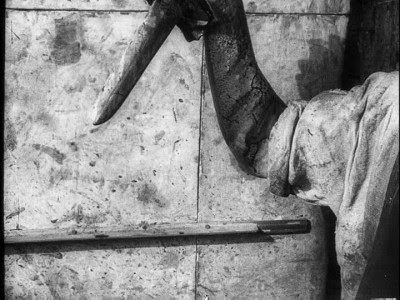 Russian filmmaker Sergei Eisenstein's 1925 debut Strike is an auspicious arrival for the man who is largely credited with establishing the art of the montage. This silent tour-de-force is a political drama, part historical document and part propaganda device. Scripted by four different writers and originally intended as the beginning of a larger series detailing the workers' struggle in early 20th-century Russia, it re-creates a real factory uprising from 1903, but the filmmaker inflates the terrible battle to an epic scale, making history into filmic art. In terms of plot, though Eisenstein divides the story into six different chapters, it's actually far more simple than that. Strike can pretty much be broken down into three acts: the events leading to the walk-out, the long wait for the people's demands to be considered and the toll it takes on the striking families, and the final clash after the demands are rejected. 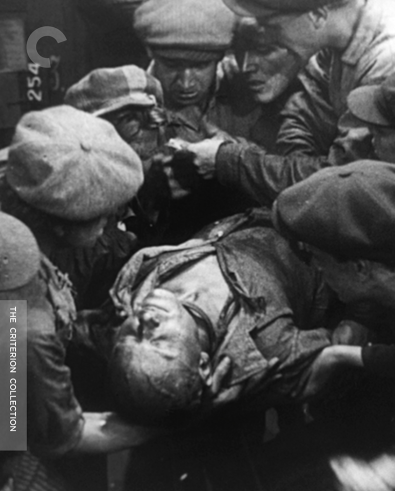 Within this, Eisenstein details all facets of life, from the homeless criminal to the common working family and all the way up to the fatcats that pull the purse strings. The director even takes time for the smallest creatures among us: pets and stray animals, and also children. The footage of poverty could almost be passed off as documentary; Eisenstein and his trio of cinematographers stage the scenes with an eye toward realism, photographing all the squalor in order to make their case for better conditions for the common populace. On the flipside, Strike's depiction of the upper classes borders on caricature. The bosses embody a cartoon villainy, wasting food while their underlings starve and laughing at their misery. 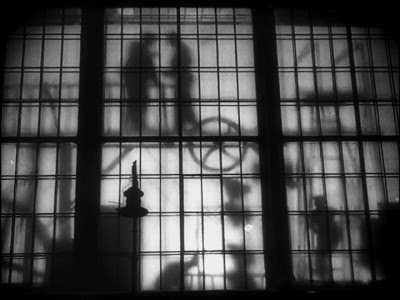 While the young filmmaker displays an extraordinary facility for visual metaphor, at this stage in his development, Eisenstein is also prone to overdoing it. Whether this was the result of youthful folly or a conciliation to the propaganda machine is hard to say. Strike paints the picture of a vast conspiracy amongst the government and men of means. Undercover agents sneak through the workforce, spying on them and reporting any questionable activities. 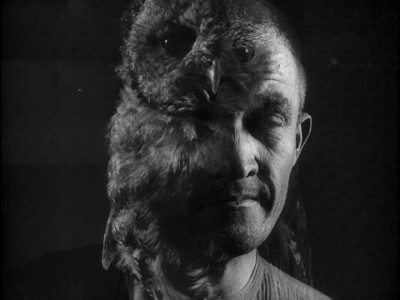 Eisenstein gives each of the covert infiltrators an animal code name and then proceeds to not only have the actors embody their monikers, but also cross-cuts their activity with images of the actual animals, layering their faces using double exposure and fades. It oversells the point a little, especially when one agent, nicknamed "Bulldog," is shown panting and drooling as if he were an actual dog. In other instances, when the animal imagery is better integrated into the story--the starving kitten scavenging amongst the suffering masses; the slaughter of livestock as tempers flare--the juxtaposition packs way more punch. Strike doesn't follow too many central characters. 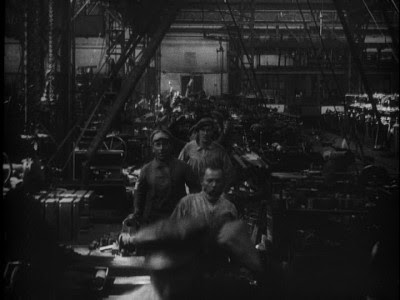 The spies, the factory owners, and a few of the workers make regular appearances, but Eisenstein treats each group of people within the clash as if they were individuals, underscoring the rallying cry for unity amidst the classes. Some of the large-scale crowd scenes are breathtaking. A brutal raid on an impoverished tenement plays out on a variety of physical levels, as police on horseback drive residents from the top floors down to the bottom. Likewise, the scenes of crowds moving on the factory are astonishing. The orchestration of such a massive cast shows how vital cinema was as an art form right from the get-go. There were no limits. Eisenstein also tries out many different camera tricks and experimental effects, favoring cross-fades and images within images to tie different aspects of his tale together. This affinity for transitions lends Strike an editorial agility, infusing the realistic storytelling with a sense of peril and melodrama. The director's reliance on exaggeration also gives Strike occasional notes of surrealism. In one sequence, a diplomat has little people dancing on a table as background entertainment; in another, a whole community of squatters reveals themselves by popping out of holes in an underground shantytown Eisenstein pointedly dubs a "graveyard." These touches ensure that not only is Strike visually inspiring, but also that its intended message never overshadows its primary role as entertainment. Strike is as vivacious today as it must have been nearly a century ago.